Aside from my Sunset Shawl, I had two sweaters on my needles that I was trying so hard to finish before the first of February, when three knitalongs will be starting. I did finish Clarke, (Thank goodness it fits just fine. I needed a break. ), then I moved on to finish Pomme De Pin. People, I could've finished it before the first. I had half a sleeve and the collar and a day and a half to work on it. But somewhere, mid-sleeve, I woke from my usual fog and realized I'd screwed up every centered,double decrease stitch in the entire sweater. 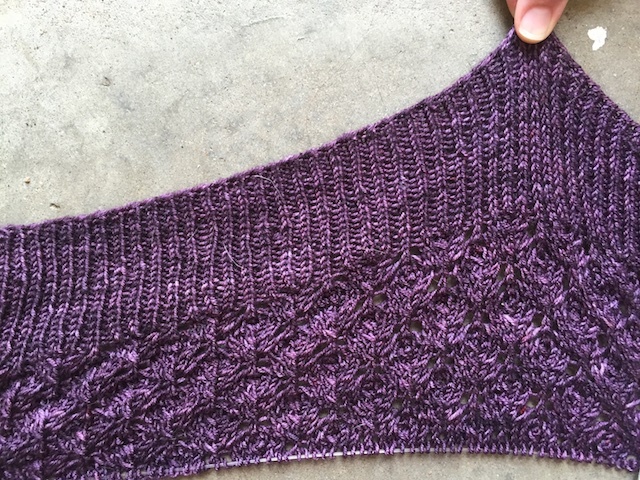 A centered, double decrease (or CDD, for those in the know) figures heavily in this pinecone lace pattern. All of those CDDs create a nice vertical line as they line up, one under the other. Mine didn't. 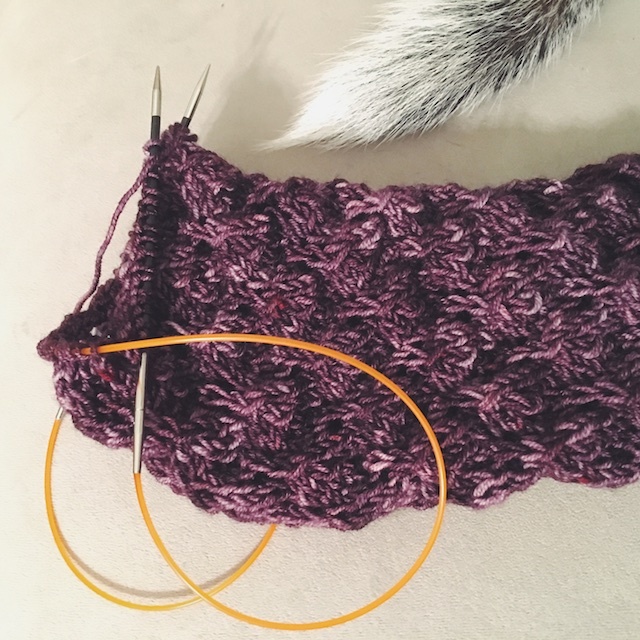 I must have misread the definition somewhere on the web because I knew it was wrong, but as usual, I just plugged on with my knitting, finishing the body, thinking, "Hmmm, maybe it'll look better with blocking." Then I finished the first sleeve. "This doesn't really look like pinecone lace." Then I was halfway through the last sleeve when I finally, finally looked the term up online again. A flock of birds fled my neighborhood, then there was silence. This time there were no shrieks bouncing off distant mountain ranges. No, I was pretty cool about it. In fact I kept my face a blank mask... the rest of the day. My son got in the car after school to find The Mask. The kitten crawled up in the lap of The Mask. What was that hovering over the soup pot at supper time? Why, The Mask, of course. 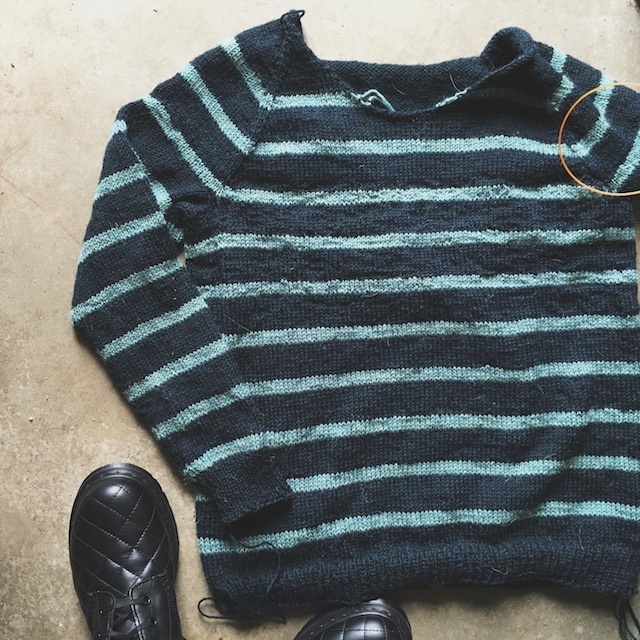 Then I saw the True Friend sweaters being knitted by both Dani, of Little Bobbins, and Vanessa, of Kill to Craft, on Instagram. I was really tired of ripping out all of that lace, and I did have the yarn for True Friend in my stash. I had bought it when Veera and Joji were at Madtosh Crafts for knitting classes. It was a sign. I was meant to bury my sorrows in a new project, one that would be the perfect distraction for the already distracted mind. I'm using Madelinetosh in Esoteric and Antique Lace and working on it as part of Vanessa's Kill to Craft Sweater-along. When I'm finished with that, I want to knit Reindeer, by Alina Schneider, for the Sweater-along, too. This is a special knit for me as Alina is a good Ravelry friend and this is her first sweater pattern. It's gorgeous and I'm hoping my Malabrigo in Azules does the cable work justice. It is more variegated than I thought from the little photo on my computer screen. Now that it's February, there are two more knitalongs starting: The Great Northern KAL, for which I'm making Cherry Pie in good, old Patons Classic Wool. So, I think my mind will be successfully distracted from the Pomme de Pin massacre. That's pronounced "mass-a-cree." 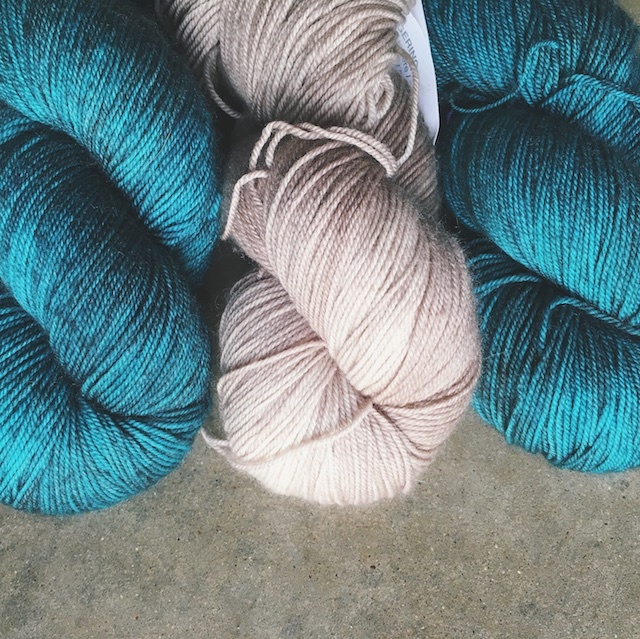 Okay so that's four sweaters, a shawl, and my 2016 sock goal. 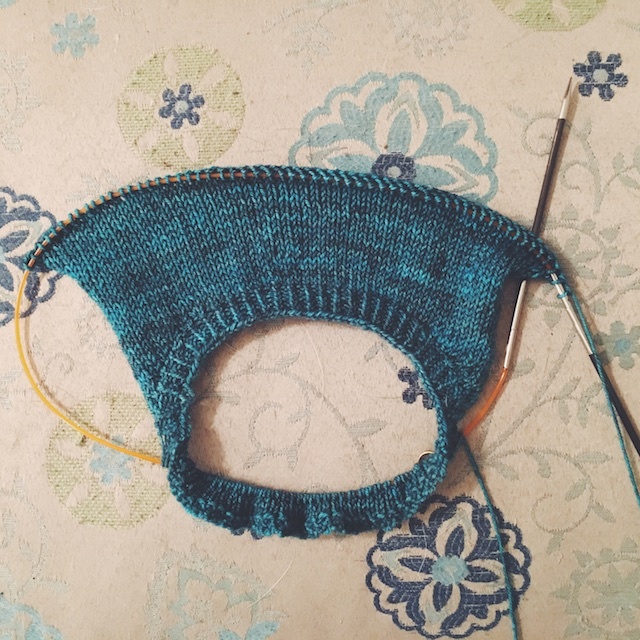 I'm hoping that drowning my sorrows won't bury me in unfinished projects this spring. 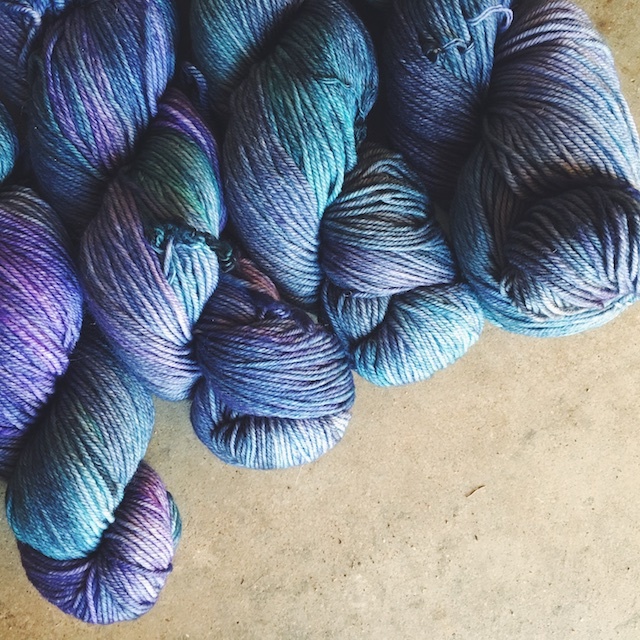 What do you drown your knitting sorrows in? Katrina already told me, on instagram,- ice cream.